Along with cooler weather here in Ohio, we also have Flamingo Football Season! Yes...it is true....those are Flamingo Fans watching the Flamingo Football Game. My crochet is coming along...sort of. I keep practicing. Last night I tried 3 different tutorials on the WWW and I could not get any of them to work for me. Guess I must really need a true lesson so I can make more progress. For those of you who may not follow Judi and Clint's blog, Green Fairy Quilts, they are leaving for Romania soon. Please, please, please stop by their blog to wish them safe travels. Unfortunately I've not had the opportunity to meet Judi or Clint face to face, but they are a young couple I greatly admire for so many different reasons. Hop over and give them a visit. Last week I was on Patsy Thompson's website looking for some Kaffe Fassett polka dot fabric and I just tripped across some amazing new sewing tools made by Ernie Bode (aka Patsy's husband). They looked so amazing I ordered one of each for myself so I could check them out as possible Christmas gifts. I bought a peacock seam ripper on a silver necklace, a purple stiletto and a peacock writing pen with a stylus tip. When they arrived I was so excited. They are all very nice quality; definitely items I would be proud to give as a gift. This is my seam rip. It is on a lovely silver chain and the tip comes out and it can be turned around so the point is inside the handle when not in use. No worries about getting stabbed when I'm sewing....very nice indeed...giggles. I also purchased a stiletto and I'll show you here how the tool comes out and can be turned around to keep the point safe. There is a nice snug fit so there is no risk of slipping out and becoming an annoyance. Here they are with the tips turned inside. Talk about impressive ay? Wait until you see my fancy smancy pen with a stylus tip. Look how beautiful my pen is....it is wonderful to hold too. The pen twists open and the stylus on the tip is great for touch screens on your phone, computer, sewing and embroidery machine screens and ipads too. Earnie also has pens on the silver chains for those who loose their pens (and I would not want to loose mine that is for sure). You can see all of the beautiful things Ernie makes on the Patsy Thompson Designs website. Be sure not to miss the Ruler Holders as they are absolutely beautiful as well. "Please Do NOT Forget The Surviving Hot Shot"
As we all know there were 19 lost and 1 survivor and while most of the attention right now is focusing on the families of the lost, I want to remind all my quilting friends that I am working on putting a quilt together for Brendan the long survivor. I asked a few weeks ago for 6.5" squares to be mailed to me and when I had gathered enough I would put them together to finish a quilt, have my local fire department members sign it and then send it out. Sadly, at this writing, I have only received 3 squares. I had asked you completed the square and then write on the front your name, a good thought and where you are from. I want this to be a quilt filled with love and prayers and good wishes. I know not everyone could take the time to make a quilt, but I know most of you can make a 6.5" square and place it in an envelope and mail to me. So, lets show Brendan some quilting love! Send me an Email and I will send you my address! I plan on making some blocks to ship along...won't you join me? Thank you all for leaving such wonderful comments! Is it really "Easy Peazy"? Remember the beautiful placemats I saw at Checker Open House a few weeks ago? I thought they were just beautiful and an excellent idea for a quality gift this holiday season. Fortunately for me, Margaret Travis from Easy Peazy Sew So Easy sent me a few of her patterns to review. When I started to make my placemats.... well....I did what any messy person does....I pulled out all my batik fabrics and started to see what I had that would go together nicely. Did I read the pattern through first? Nope! I went straight for the mess making event. LOL....terrible I know...but I do love playing in the fabrics. Once I decided what colors I was going to go with, I then opened the pattern and read it thoroughly. I decided to start with Stripy Stripey Placemats. I love, love, love these placemats!!! I used the Bosal Double Sided Fusable Craft Tex 16" circles as the base. The cool part is once you've sewn your top layer all you have to do is fuse it to the 16" circle. Very fast indeed! I was surprised by was how the binding is done on this pattern. When I first saw the pattern I thought it would be like traditional quilt binding and I would have to hand stitch down the binding. NOPE! That binding was the easiest binding I have ever done. The Stripy Stripey Placemat pattern is written so well I believe even a newbie can be successful in making wonderful placemats. LOOK at all the fun placemat patterns by Easy Peazy. I'm just guessing I'm not the only one who thinks these are fun. Would you like a chance to win two Easy Peazy Palcemat Patterns of your choice? Here are some Easy Peazy ways to have several opportunities. Do any or all of these things for your chance to win and leave a comment on this post telling me that you have done it. You will get one chance for each thing you have done. Like Easy Peazy Sew So Easy on Facebook for ONE chance to win and leave a comment on this post that you have done this. Leave a comment telling me which two patterns you would choose. You must have a US or Canadian mailing address to participate. If you don't have one and are from outside these two countries, have them shipped to a friend in one of those countries and have the friend send them to you!!! I will do the drawing by random number generator (is there any other way to do it?) and I will choose 3 winners on Friday, September 20th. Best of luck to all of you and I know you will have a ball making these lovely placemats for yourselves and for friends and family. THANK YOU Margaret for turning me on to your lovely patterns!!! Do you remember Caleb Willis from Island Batik? 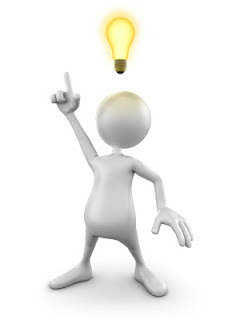 If you are a long time follower of the IHAN® blog you may remember THIS POST. What a day I had at Island Batik....definitely on the top of my list of excellent days! Caleb is the President and CEO of Island Batik and from one President and CEO (ROFL) to another, I think we hit it off. I was most impressed that he didn't throw me out when he found me napping in the heavenly batik fabrics. Very Presidential of me isn't it? Now you know why I'll never be invited to the White House! Caleb had an excellent idea to help veterans after hearing stories from family and friends who had returned from the Service. He was committed to helping but wasn't sure if one company could do enough to make a difference. 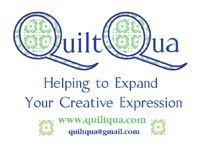 Caleb knew the wonderful spirit of the quilting industry and he approached some other fantastic people (see list of other sponsors here) and shared his idea. That is how Quilted In Honor was "born". Now Island Batik helps to raise funds and awareness along with Operation Homefront. How many of you know about Operation Homefront? I didn't really know much until SewCalGal hosted a fundraiser for them last year. 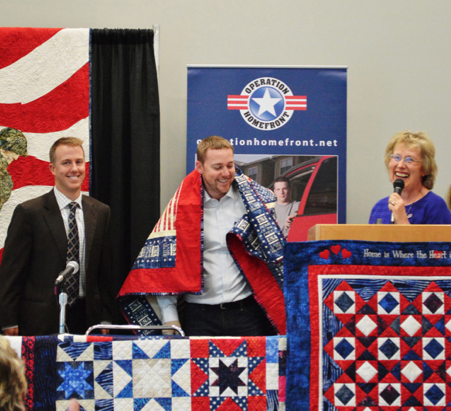 Once I began learning more about what Operation Homefront does, I decided to hop on board and I contributed to SewCalGal's fundraising efforts. For those of you who don't know, Operation Homefront provides assistance to military families in their times of need. Can you imagine serving your country, being away from your family and possibly being in combat only to arrive home and find yourself having difficult times? I see it as a project where we can help support those who have given their time, energy and many times their lives by serving in the US Military. Caleb Willis, Adam Jennings Medically Retired from the US Marine Corps. and "Lady Eleanor"
Lady Eleanor presented Adam Jennings with a quilt that she designed.. I don't think anyone was surprised to see that Lady Eleanor was involved...she is one kind, sweet and amazing Lady. You can purchase Quilted In Honor products and a portion of the sales price will go to Military Families being supported by Operation Homefront. If you purchase the Aurifil Quilted In Honor Thread Collections from IHAN® 90% or $54.00 of the profit will be donated back to Operation Homefront. Make and donate a quilt. There are several free patterns on the Island Batik website. Just CLICK HERE to see them. If you want more ideas about how you can get involved with Operation Homefront, you can CLICK HERE. That is how Caleb's great idea turned into the Quilted In Honor project. Given Quilters are some of the very best people I've ever met in my life...none of this is surprising.....it is Wonderful though isn't it? Fons &; Porter, Daily Craft TV, have generously offered one IHAN® Blog Reader an opportunity to take "String Piecing 7 Ways." Daily Craft TV offers classes in Sewing, Quilting, Crochet, Knitting, Scrapbooking and Paper Crafting. If you click HERE you will be able to see the preview for the class. The winner of the class is Barbara Woods. Congratulations Barbara!!! I had a chance to watch the class yesterday and I think if you have a lot of scraps or like jelly rolls you will learn some tips for making some very fun quilts. Fons & Porter, Daily Craft TV, have generously offered one IHAN® Blog Reader an opportunity to take "String Piecing 7 Ways." Daily Craft TV offers classes in Sewing, Quilting, Crochet, Knitting, Scrapbooking and Paper Crafting. How to make sever different blocks for seven different quilts including a star, diamond star, strip quilt and more. Learn how to string piece applique shapes. You will also be able to download, Island Campfire Pattern at no charge. The drawing will be done by random number generator and a winner will be chosen on Monday, September 9, 2013. I definitely think I'm a candidate for a Crochet class. Below is a photo of my attempt at learning to crochet and make a wash cloth. How sad is that? To me it looks like one of those dresses people up on their dish soap bottles. I was "trying" to make a dishcloth. Oh well...practice, practice, practice....LOL. I know I'm not alone when it comes to "fudging" when something doesn't quite go as well as planned. Take for example the fraying on this tiny border I was working on over the weekend. I wasn't going to risk further fraying when the 1/4in seam went into this tiny border. Have you ever had that happen? Finish a project only to notice that there was fraying and now the seam doesn't hold? I have no more of this fabric either...so it was time for the ole "fudge factor." I was pressing when I noticed the fraying and on my pressing board I had a roll of Batting Seam Tape so I thought...I'll just cut a thin strip and fuse it on the edge and that will hold the seam and prevent further fraying. The Batting Seam Tape is soft and easy to stitch through and I have my fingers crossed that I don't have any further problems. What would you have done? Any great secrets floating around out there? Life has been a bit crazy lately with my co-workers going back to school last week. Where has the time gone? Just yesterday Aaron was starting Kindergarten and I was driving behind the bus crying all the way to their school. Are you wondering if I still cry? Honestly...I just mist up a bit...I guess it is what a Mother does ay? Warning...what is written below may be controversial....but to me it is plain common sense. Speaking of "Fudge Factor"....something is smelly with this Fudge or so it seems. On another subject all together, we spent the weekend working out tails off and I had an entire van load of things to take to the Goodwill for donation. I always feel good about donating to Goodwill because of their great programs. As I was driving away from Goodwill I saw a huge blue dumpster, the type that is used on construction sites. It was overflowing and I could not believe my eyes. I hopped out of my van and took these photos....any idea what you are looking at? Some of us would call it "donations" made with the thought that the items will go to good use and the money being made would help someone in need. Others may call it TRASH. Yep....the dumpster was overflowing and the items I could see from the top were perfectly good...a great majority anyway. I saw record albums, movies, tools, dishes, clothing, radios, baskets, decorations....I felt ill. Literally ILL. Yes, I will write to the Goodwill and let them know but I'm guessing they already know. I went inside and asked a worker there why that was the case and he said that is what happens when they have too much. What is too much I asked myself? Too much for the building....to sort....for the shelves? How about a huge lot sold by auction and any amount of money would be useful to the Goodwill....not paying a garbage company to haul away our donations. I don't write this to single out the Goodwill. I see this type of thing weekly in my comings and goings. People have no qualms about filling our landfills with perfectly good items because they don't want to take the time or energy to do what I think is, "the right thing." I put quotation marks around that because these are my thoughts and I've not done much research into the entire process of re-purposing....I just know my conscious and I can't do it. I stopped and got out of my van one day by a grocery store. I watched as the workers unloaded 5 or 6 entire grocery carts of food into a dumpster. I began taking photos and they got very upset and approached me. I told them I just could not believe my eyes....and YES, I know the food is expired. I then told them that since they are aware it is expired then they know perfectly well when the food will expire and they can either donate it or reduce the price 3 or 4 days in advance to save the enormous waste. I was told they were just doing their jobs. OK...I'm getting off my soap box for the moment....please forgive me....sometimes I just have to "say something" and today was one of those days. Know I appreciate other people's opinions, experiences and the people themselves. I also am very glad the Goodwill does what they do...most of it anyway. Smiling at the relief that I've said something!